This Jalapeno Pepper Jelly was the second product that mother and daughter at Brimstone Originals developed and is less hot than the Habanero Pepper Jelly. Try it as a glaze on ham or pork, use it in a mustard sauce or warm in the microwave for 20 to 30 seconds for a tangy dip. 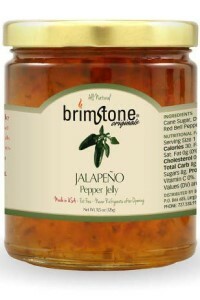 Like all Brimstone Pepper Jellies, you don't need to refrigerate after opening. Ingredients:cane sugar, distilled vinegar, jalapeno peppers, red bell peppers and pectin.